What Materials are Used in Soundproofing? 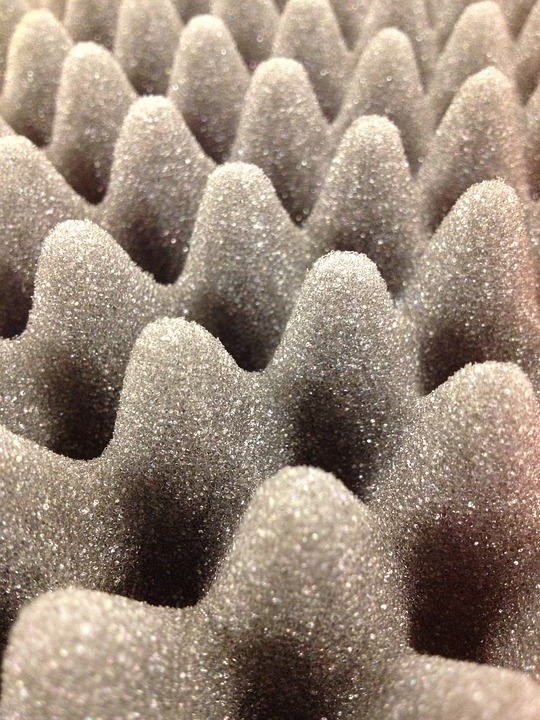 This material is often called studio foam. It can be noticed by its distinct pyramid shape and is used most often in studios or other sound-creating rooms to muffle the noise for the rest of your home, neighbors, or to maximize sound quality in professional recording studios. This is made of mineral wool, rock wool, and fiberglass. 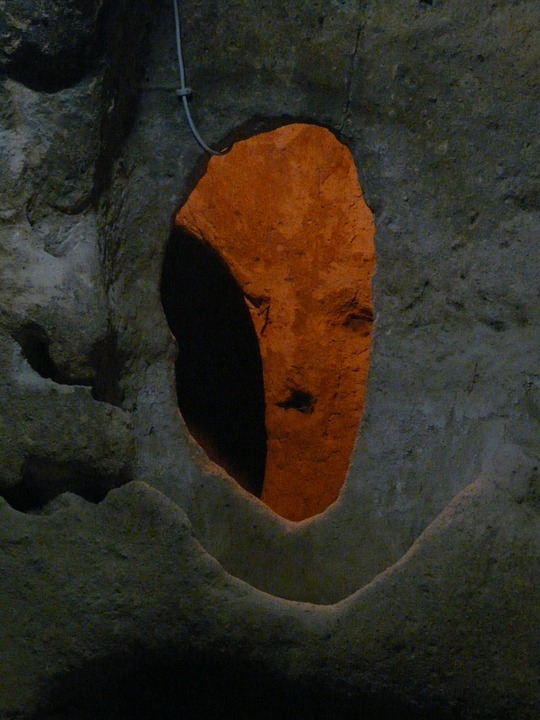 It is designed to fit behind your walls. It helps by reducing the amount sound can travel between your home through the walls. These are made up of sound insulation materials or acoustic foam, only designed specifically for better aesthetics. This way, if you don’t have extra space between your walls, you can incorporate your soundproofing as part of your interior design. These fabrics are often used in studios or theatres. They are very heavy and minimize the amount of noise coming through the walls. By using a dense rubber like Mass Loaded Vinyl, otherwise known as MLV, a variety of different rooms and items can be better soundproofed. Hearing your neighbors or other family members walking overhead can become very annoying, very quickly. If this is the problem that is causing you distress, then there are a few underlayment options. It will require your floors to be redone so that cork, felt, or polymers can be installed between your floor and subfloor to reduce noise. Double paned windows, thick doors, and even traditional insulation can all help improve the soundproofing abilities of your home. If you find that the windows let in too much noise, consider replacing them or installing thick, acoustic fabric curtains, and so on. Installing soundproofing in your home can be the solution to all your woes, and by knowing what options are out there can help you make the right decision based on your needs. Done right and chosen well, you should enjoy a property that lets in less noise, perfect for those sharing walls with neighbors or busy roadways. Alternatively, they can be necessary if you yourself create a lot of noise, for example in the creation of music. There are many reasons why you might need soundproofing, and there are many different materials and soundproofing options out there to choose from. That is why it is important that you choose the right materials for the job at hand so that you can get the results that you are looking for. Escape rooms are a big hit with celebs and mere mortals alike. Imagine being in a room with a series of puzzles to solve. The clock is ticking, and you have 60 minutes to solve the clues. If you fail, you are stuck there … forever! OK, so that’s a bit of an exaggeration. Nobody ever ends up trapped in an escape room and there is help available if you get stuck! But, even though you know that the peril you are in is contrived, it is still a lot of fun. If you are not convinced, visit an escape room Columbus and see for yourself. Each room has a different theme, from runaway train to casino heist. You can even try solving a crime! Not surprisingly, many celebs have tested their skills in an escape room. Read on to find out who had a go. This one might surprise you, but the Obamas took some time out to visit a local escape room. The Obamas visited an escape room when they took a Hawaiian vacation. Barack probably needed a bit of a break, as he was in office at the time. He, Michelle, and their daughters tried Mission Manoa, which the organizers say is one of the most challenging escape rooms they have. The word is that the Obamas rocked at escape rooms and were able to escape with seconds to spare, despite having some tough puzzles to solve. Meet the Blacks is unapologetically terrible. This low-budget horror-comedy (if you can believe there is such a niche) has a one-star rating on Rotten Tomatoes. Still, nobody can fault the marketing talent behind the movie. In a bid to create a memorable experience or the stars who attended the movie’s premiere, the organizers created a series of escape rooms. These included a hostage room, a casino room, and a museum heist room. Stars had to solve the clues and work out the puzzles within the one-hour time limit. We don’t know how many of them were successful, but we assume they had a great time. Chris Evans, aka Captain America, is a huge escape room fan. He loves the idea so much that he went to a lot of trouble to turn a bookstore into his very own escape room. Rather than Chris himself doing the ‘escaping’, the customers who came to the store to buy books were caught up in his prank. Chris instructed the people locked in the store to solve the puzzles, search for codes, and talk to agents. He used a Captain America doll to communicate with them. The whole stunt was designed to promote Chris’s charity escape room adventure, where ticketholders can play the game with Chris and raise money for his cancer charity. Everyone who took part in the challenge had a lot of fun, apparently. There are undoubtedly many more celebs who have tried the whole escape room thing. We feel certain that the Kardashians have tested their brain cells at least once. 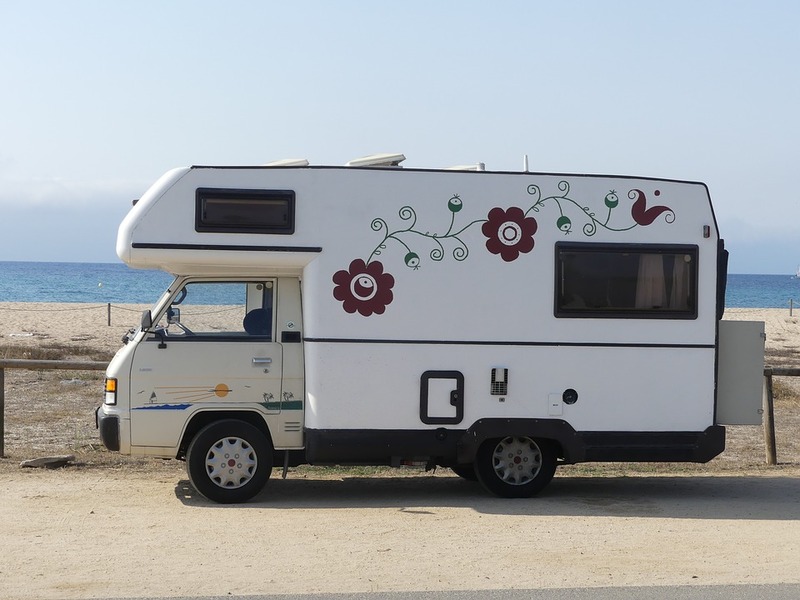 Whether you’ve recently become the happy owner of a recreational vehicle or you’ve decided to rent one to finally be able to go to the places you’ve never had the chance to visit, the fact is that traveling with a motorhome can be adventurous, exciting, and very satisfying. But the truth is that you need to be very organized to make sure that you don’t forget something essential at home. We would advise you to start your adventure by creating a checklist. If you can’t be bothered with writing down everything, there are checklist models to be found online, so you can conveniently use one of those. If you’re renting the RV, it probably comes with everything you need. If you’re not, here’s what you should know about the most important things it should come outfitted with. Whether you intend to travel in winter or in the summer, the fact is that nothing beats a good air conditioning system. One of those that you can use both for heating and for cooling is definitely handy, and it can mean a lot in the way of providing you with the comfort you need. Being rested in the morning takes the cake, especially when you have a whole day of visiting tourist attractions ahead of you. If you’re tired, you’ll be cranky, so there’s really no point of saving up on getting a quality mattress for your RV bed. There are two main things you need to consider when it comes to plumbing. One of them is how you’ll get rid of the things in your RV toilet and just what model suits you best. The second thing you have to mull over is the type of water heater you will need. Obviously, you will use this type of product for both cleaning your body and the interior of the vehicle, the dishes, and a variety of other things. There are both traditional and tankless alternatives, and while some people might try to argue that a tankless one can get damaged a lot easier than its counterpart, that really isn’t true. Water heaters these days are very versatile and well-designed and well-constructed, so you have at least ten years of working performance to expect from any you choose, provided that you don’t go for the cheapest one ever. If you like watching TV, you might need an RV-specific TV. On the other hand, this type of entertainment device might be useless if you love spending your spare time browsing the web and watching TV shows without any commercials. A Netflix subscription is affordable, and the best thing about the vast majority of the campsites scattered across the United States is that they offer free WiFi for the fee of staying there. As such, you’ll only need your laptop and a VPN extension. The VPN is totally necessary if you don’t want your personal data to be collected and used by anyone. Why Investing In A Luxury Property Is A Good Idea For The Future? Serial investors and advisors will readily agree to the fact that real estate is one of the most appealing, popular and secure investment vehicles all around the globe. An individual who is looking for an investment opportunity that will give high returns in the future, then as per statistical data, investing your hard earned cash on a luxury property is the best way forward! It is often seen that in growing economies, the term ‘luxury’ is often used as a mere marketing gimmick where the product sold has only the essential amenities/features. In case of a luxury property, it should be located at a high-class locale, should have all advanced creature comforts that, at the end of the day, might seem a bit excess! Now that is what one can call a luxury property! After giving the above-section a read, one might be asking themselves the question, ‘what drives people to invest in luxury properties! ?’ Long story short, social status, a thirst for high-quality living and guaranteed returns in the future! A luxury property oozes status! Investing in a luxury property guarantees its owner a life of prestige and high social status. People work hard to make ends meet and often they find asking themselves what it is really like to live a life of luxury. A person looking for an investment vehicle should go for real estate, specifically, luxury properties. A luxury property is generally located in posh locales making the environment ideal where the neighbourhood will be oozing class and great vibrations. After all, if you have the means, why not treat your family and yourself with a great environment to move in to!? Luxury properties are equipped with the latest features, amenities, technologically advanced features and what not! Most, if not all, luxury properties come with a monthly or annual maintenance fee. It includes charges for the advanced security features and the recurring cost of security personnel, serving round-the-clock. The best part of owning a luxury property is the quick response of emergency services to posh locations. Most of the time, luxury properties are located in proximity to emergency services like a hospital. A luxury housing complex can even boast of its own medical facility, shopping complex, entertainment and education facilities, emergency fire response team and police station! Assured high returns in future! Since time immemorial, gold and real estate are considered the most stable investment vehicles all over the world. The population of developing nations is shifting their focus from gold to the luxury real estate sector. It is due to the guaranteed high returns one can get when a luxury property changes hands! Investing in a luxury real-estate property is perfect when one is aiming for a long-term investment opportunity. As per the tips provided by real estate gurus in SmartOwner’s website, the price of a property grows exponentially with time. If you are a patient property owner, you can hold on to your luxury property till its value reaches sky high and sell the same when the time is right! Isn’t that great!? Investing in a luxury real estate is investing in a security that is an active performer – or ‘active performing asset’. An active performing asset is a security that gains value over time thereby serving as a practical asset, not a liability. 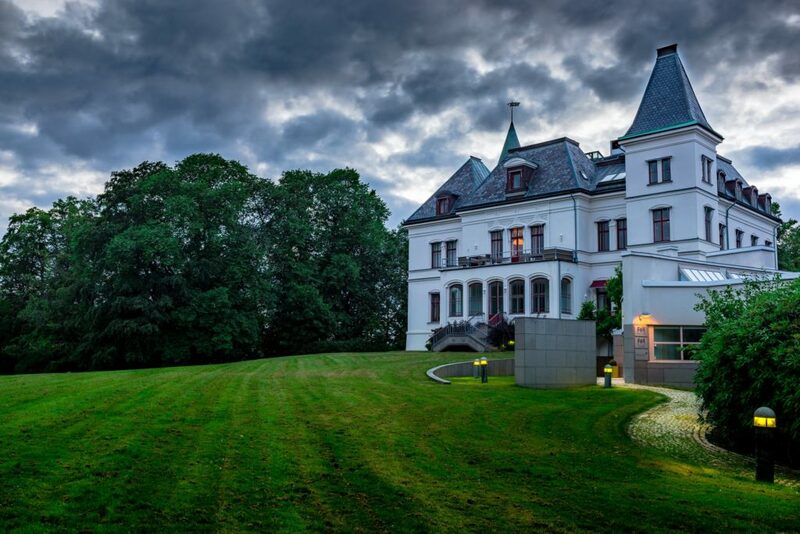 Luxury properties are always in demand, especially in countries with developing economies. If you live in a developing nation, invest in a luxury property, hold on to it, wait for a buyer with deep, very deep pockets and let go of it when you get the right price! I guess you may not have heard it often enough but your home is an important part of your personality. That means that the way you treat and keep your house says a lot about yourself and your innate characteristics. 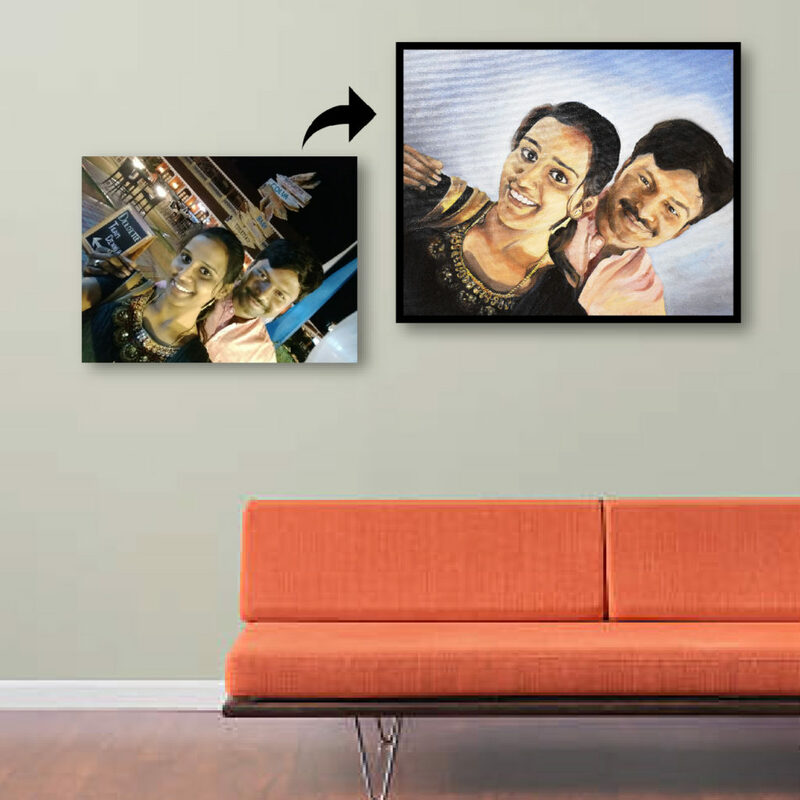 Get a portrait painting and create a lit ambiance inside your home. Make it a place where all your colleagues and friends are just startled and in awe of your house’s intrinsic as well as extrinsic beauty. 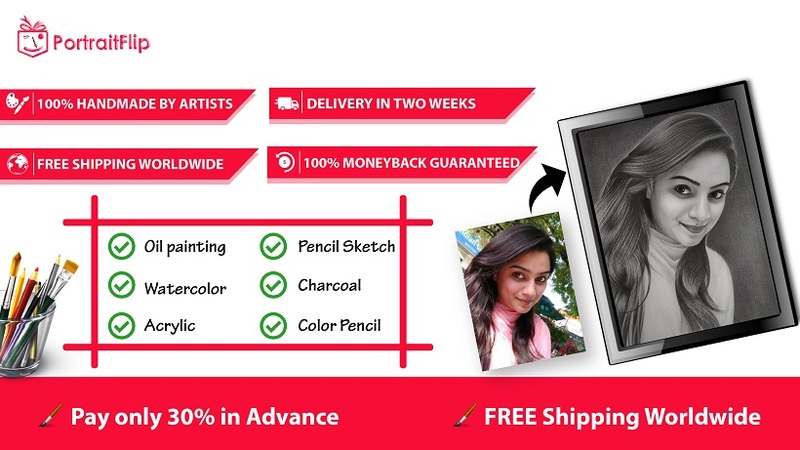 Imagine a huge custom portrait painting hanging on your wall. Isn’t it the perfect showpiece there is for your humble abode! Since ages art has been a great way to showcase and portray several different emotions. Painted portraits have great visual appeal and thus are sure to grab many eye balls. Many a times we overlook or simple neglect the state and look of our house and only tend to it on really special occasions such as festivals or birthday parties. Don’t you think that your home deserves something more, something special? 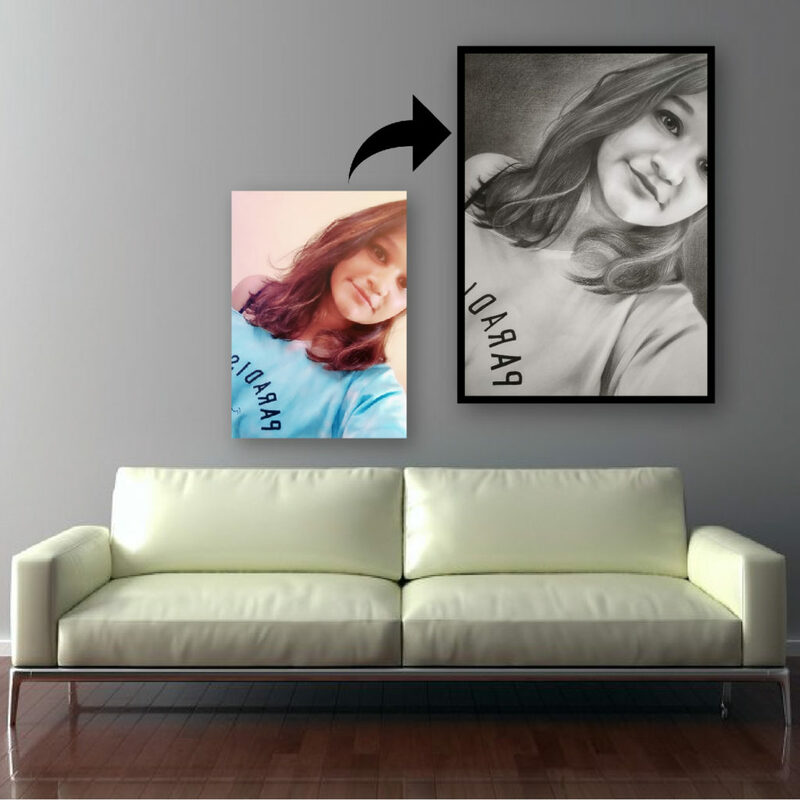 Well turning photo to painting is a great way to not only relieve some awesome memories that have gone by but are also a great way to make your home more stylish. 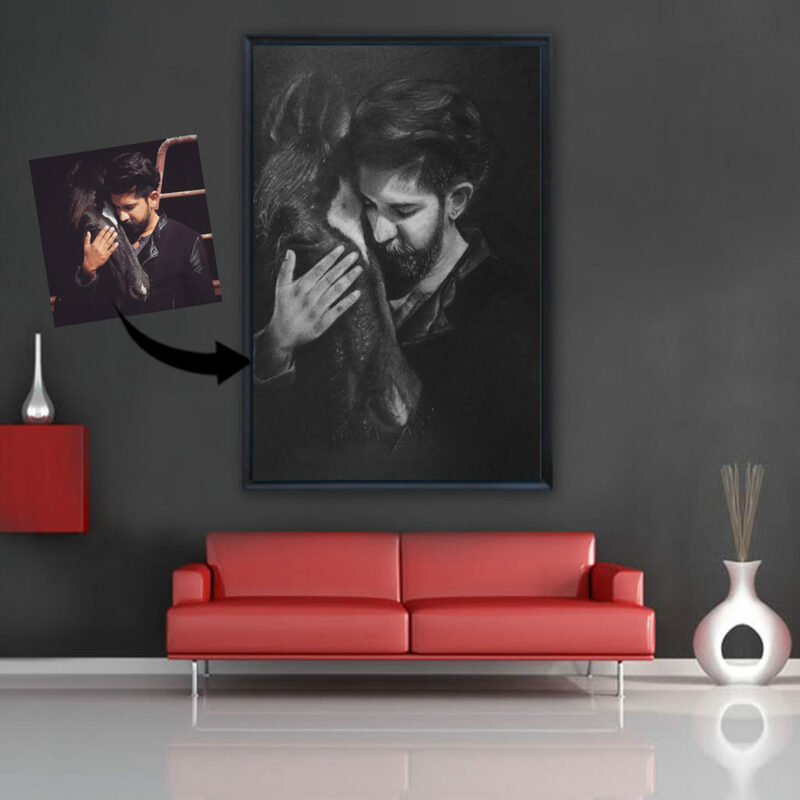 Your beloved memories put on canvas in an artistic way are bound to capture anyone’s imagination and touch their heart. It is therefore a great way to show your love towards your home. A home is not built only by bricks and mortar rather it is built by the many memories, moments and happy times that one has spent in that particular space. 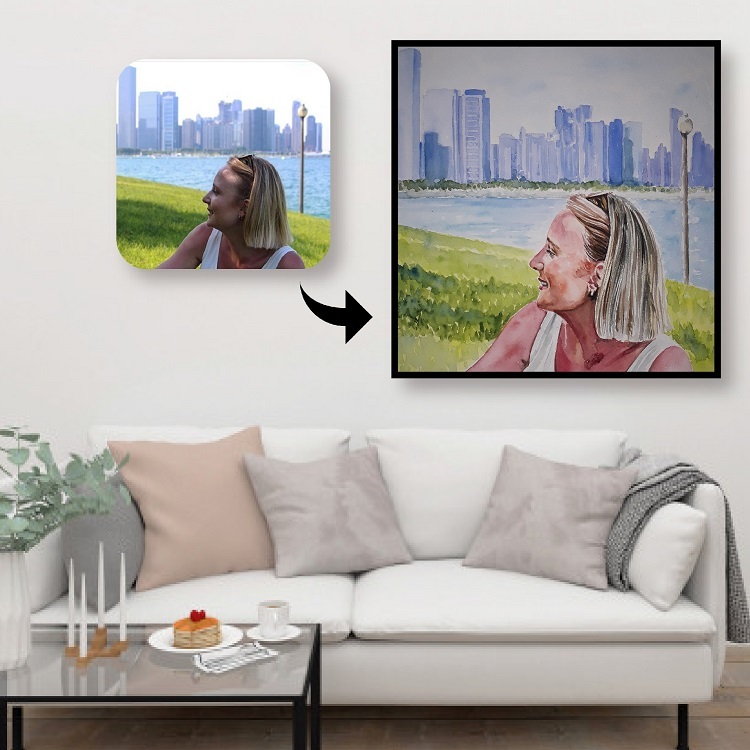 PortraitFlip is one e commerce site which sells authentic handmade portrait paintings that too at some unbelievable prices. They offer a wide array of mediums to choose from such as oil portraits, charcoal portraits, watercolor portraits and more. All of this accompanied by some great customers service is surely one of the reasons why I would recommend PortraitFlip to everyone. Home is where the heart is for it has watched you grow up first hand. In a manner of sorts it has seen your good as well as bad days, it has seen you evolve from a baby to a teenager and eventually to an adult. It has and will always continue to protect you from a world which can seem very cruel and terrifying at times. Convert picture to watercolor painting and watch as it takes a beautiful form of its own. A painting especially a custom portrait is really special because it is a story written by you and directed by the painter himself in which the canvas and paints are the medium. The audiences are all the people who view it much like your normal movie. It is almost poetic in a way. This is a great analogy to understand the talent and creativity that it takes to actually create a real masterpiece. A portrait painting is not just a collection of strokes of paint on a canvas but is something really special for the painter as well as the receiver. It is a story, a poem, a speech or an essay minus the words but it still has the ability to captivate the audiences. It is certainly a great way to capture one’s attention and keep them occupied for a while. Hence take a close look at all the memories that you have stored up in your camera reel and turn pictures to paint. It is a great way to make your home come alive to the special moments and times that you have had in your life. If you’ve been wanting to give your home a decorative overhaul but you don’t know where to begin, you might be wondering just what you can swap out to start giving it a new look. There are a whole host of ways you can redecorate – from redoing floors, tiles, painting and more – all the way up to changing out things like textiles, refitting light fixtures or buying new decor. Here are a couple of great, easy ways you can do up a house without needing to break the bank. For ease of decor info, we’ve even broken it up into style for you! If you’re into the executive kind of look and you want to bring more of this into your space, consider adding things like black framed, classic looking art prints of things like Paris or London skylines and the like. Consider swapping out your sofas for more square, minimalist styles in monochromatic colours like greys, whites, black and more. Glass side and coffee tables always bring a bit of executive style into the room as well. If you’re wanting to introduce a carpet or rug of some kind, consider a faux sheepskin rug – they always look extra classy against an executive backdrop. Cosy home looks are typically pretty easy to pull off and don’t require much effort unless you really want to go all out. Adding things like wood side tables, coffee tables and TV stands is a great place to start. Likewise, consider adding textiles such as cushions or throw blankets in warm, cosy shades like gold, reds, oranges and more. Homes typically look ‘lived in’, so the more lived in you make your space look, the more cosy and home-y it will feel! Add photos of family and friends around the walls, coffee table books, and thick linen curtains. The ‘Bohemian’ look is all the rage with many people today and for good reason. This cosy home-come-new age hippie look is a warm, snuggly and inspiring way to decorate a space. Think mandala art on the walls, tapestries featuring Hindu gods and goddesses such as Ganesh, Himalayan salt lamps, crystals in window sills, multi-coloured throw pillows, faux sheepskin rugs, dreamcatchers, handmade decor like curtains and lampshades and more. There is literally no wrong way to do a bohemian look and with it being a popular option these days, even just for small spaces like bedrooms to create a real womb-like, chilled atmosphere, you can find tons of ideas for inspiration on the likes of Pintrest. Salt lamps in particular are a great addition, especially considering the numerous health benefits they provide, creating a win-win situation to bettering your space as well as yourself! So there you have a couple of great ideas on ways to improve your space if you’re looking to redecorate without needing to paint or change anything too heavy duty like your flooring or windows. Just adding a bit of colour or monochrome textiling can go a long way to creating the ultimate in beautiful spaces that you can enjoy for years to come. Beach lovers always dream of going to a beach with soft white sand in their holiday vacations. However, not all beaches are nice. Beaches that get high traffic usually have problems like trash, no parking or loud music. A careful research will enable you to find the perfect beach with the ideal condition for you to relax on your vacation. 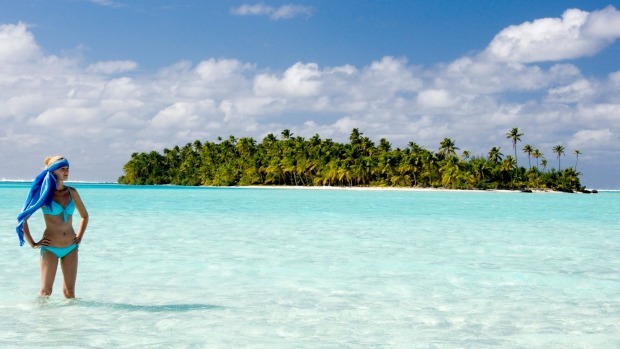 The following is a list of the 5 best beach spots in the world. Clearwater Beach is a sugar white sandy beach that offers a nice view of the Gulf of Mexico in Florida. The beach is clean without any crushed seashell or other sharp objects on the shore. There are lots of baywatchers and police riding on golf carts to patrol the beach. You can visit restaurants and specialty shops at Pier 69. There are many types of boats at the pier including sail boat, pirate ship and shark boat. There are public umbrella and chairs to use. After swimming, you can rinse off the salt water at the shower stand. Lifeguards and public car parking lot are available. Bavaro Beach is a long powdery white sandy beach that is lined with palm trees in Bavaro, Dominican Republic. The beach is surrounded with a lot of hotels and restaurants. It is ideal for couples who want to enjoy an evening walk. It is near to a small fisherman village called ElCortecito. On this beach, you will find a lot of boat tours that you can take part in. You can go parasailing on a boat driven by the local. When wearing the snorkel mask, you can see small shark, stingrays and other exotic fishes swimming in the water. Praia de Falesia is a 6km long golden sandy beach with lots of pine trees and a cliff background in Portugal. The beach is situated in between Vilamoura and Albufeira. You must descend a long stairway from the car park on the cliff to reach the beach. The stairway has a handrail and is in good condition. Nearby, you will find several high class golf courses, and restaurants. Many nearby hotels offer courtesy buses to this beach but it is near enough to walk to. Lots of sunbeds and umbrella shades are available. Elafonissi Beach is a mile long pink sandy beach with turquoise water situated on the Elafonissi island in the southwestern part of Crete, Greece. The beach is named after a Greek term called Elafi, which means deer. Sunbeds can be rented by hour or daily rate. The water is shallow and suitable for toddlers. If you come by car, you will need to drive through a narrow winding mountain road with steep cliff. There are plenty of small coves and rock formations along the shoreline. Elafonissi beach is a natural reserve area and home to more than 110 plant species. While at Elafonissi Beach, you can also visit the Chrysoskalitisa monastery. Fig Tree Bay is a gorgeous sandy beach with crystal clear water in Protaras, Cyprus. The beach is full of loungers. If you want a lounger, it is recommended that you come early before 8:30 am as it gets crowded fast. The beach gets busy with tourists but it offers plenty of rooms. You can get the Wi-Fi code from the staff and use free internet on the beach. Fig Tree Bay has disabled facilities. It is also suitable for young families who have to push their babies or toddlers on prams. In this era of modern trade practices w.r.t various demographics, social scenarios etc. marketing has a very key role to play to get any product or services successfully placed into the consumer’s mind and to get into their practice system. Each and every brand try to highlight their products through various platforms such as social media, email marketing etc. One of the most conventional and strong ways they use is through showcasing their products and their features through expo’s and shows. Most brands use this medium to go globally and to reach out to their potential customers directly and to have their immediate responses and to cater to their expectations. This helps them to have a direct analysis of the market also and to get to the bottom of demographical needs. Thus, letting them strategize their businesses and their products also. Every company needs a platform whether on their own or through local agencies to organize an expo and to reach out to the consumers at different locations. This is a very costly avenue for small organizations in spite of having some great cutting edge opportunities and products and for bigger giants also as they cannot reach out at many locations in spite of their great expenses. With one such great facility, a southern Californian company namely ExpoMarketing has come up. Starting from 1991, this company which is a leader in its sector has come up with a unique facility to provide an alternate or rather I would call a great setup for all those companies and private owners, an option to showcase and be a part of a high valued exhibition at various locations by the company. 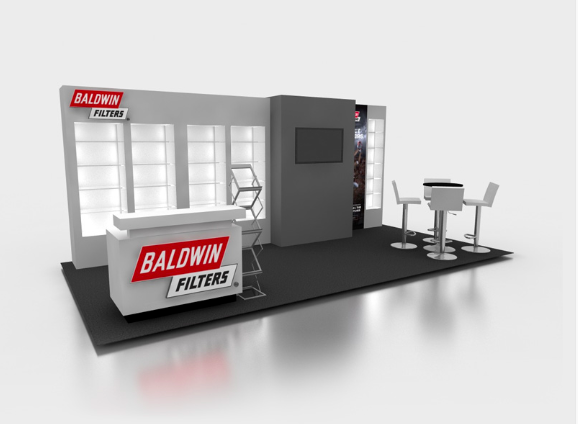 The company offers so much of customization and options starting from rental to buying a booth for an exhibition or for multiple exhibitions. The prices are decided with huge customizable options w.r.t the needs. 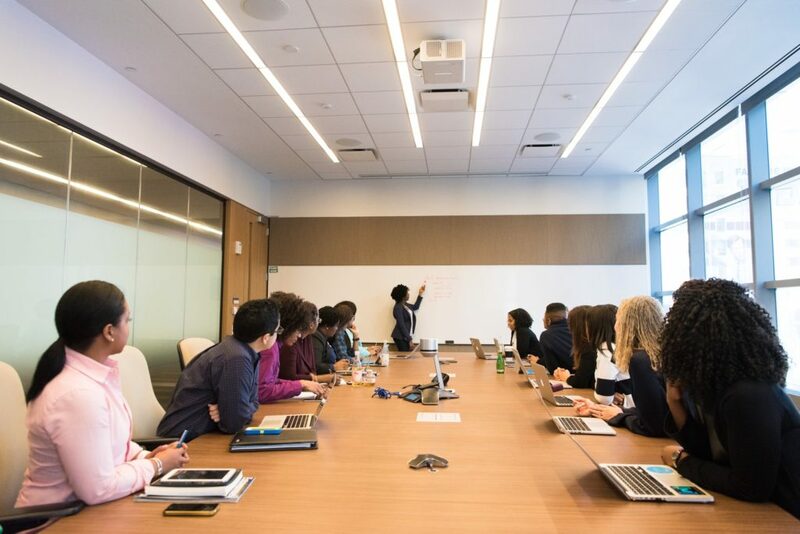 The first step in the process is to call an Account Executive to learn about the company and the brand and to discuss the show that they are attending. The company will ask you for your wishes and requirements for the booth at that show as well as the budget parameters so that to create maximum options and recommendations possible. The dedicated team of experts will then guide the brand to make smarter decisions and ensure that the requirements align with the trade show goals. It’s safe to assume that cutting down on energy costs is likely something we all have an interest in. Unfortunately, folks either believe that the only ways to save energy are overwhelming, time-consuming projects or that they require hefty out-of-pocket funds. Here you will find five of the best low-cost and simple DIY energy-saving projects that you can complete in a weekend! Lowering your water heater temperature by 10 degrees can also lower your energy costs by up to 5 percent! Regardless of how much hot water you use, your water heater is designed to maintain the water inside its tank at whatever temperature you have it set for 24 hours a day. So, while it doesn’t seem like a lot, it is most definitely a start. Learn how to adjust the water heater temperature to be sure you’re doing it safely and efficiently. Simply installing LED lightbulbs can cut your energy usage by an average five times. 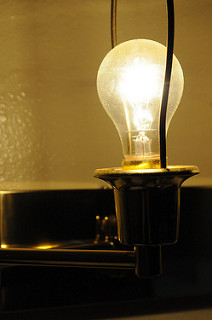 A standard 60-watt bulb produces the same amount of light as a 13-watt LED bulb. This will lower your watt usage by 47 watts per hour, and that’s just one bulb! Service all your light fixtures in this way and watch your energy costs steadily decrease. Another perk to this hack is efficiency comparison. LED bulbs have a significantly longer life expectancy than standard bulbs. Older windows can most certainly contribute to energy loss in your home. An easy way to resolve this issue is by using caulk to fill in the gaps around your windows and your door casings. Doing this will help to seal off any air leaks that may be causing energy loss, forcing your HVAC system to run more than necessary. Caulk is available at your local hardware stores and is reasonably inexpensive. With a little research, you’ll learn how to caulk like a pro in no time! Changing the filter in your home’s heating and air-conditioning system is important for a couple of reasons. One is air quality in your home, but also, a dirty filter can drastically affect the efficiency of the HVAC system. A dirty air filter decreases the flow of air through the system, forcing it to work harder and for longer than it would with a clean filter. Landscaping is an easy way to save bucks on your energy bill, and there are a number of ways to do so. Creating shade on the sunniest side of your home by planting trees not only will help deflect heat in the summer; it will help to block out the wind in the colder months. While there are many simple and inexpensive DIY projects to help you become more energy efficient, these five are a great start and surefire ways to decrease your energy consumption — all while creating a cleaner and more comfortable atmosphere in your home!